Next time you are looking for appetizers for a party, try our Creamy Crab Cheese Dip. It is warm and gooey and goes well with crackers, vegetable dippers and especially chunks of French bread. 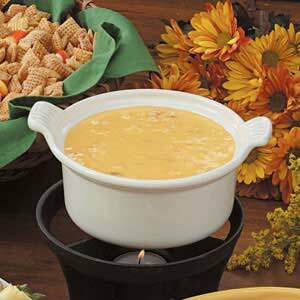 In the top of a double boiler, combine cheese, milk and margarine. Cook over hot water, stirring constantly, until cheese is melted. Stir in crab, sherry, pimiento and garlic powder; heat thoroughly. Transfer to a serving dish or small fondue pot. Serve with fresh vegetable dippers, crackers or bread chunks.